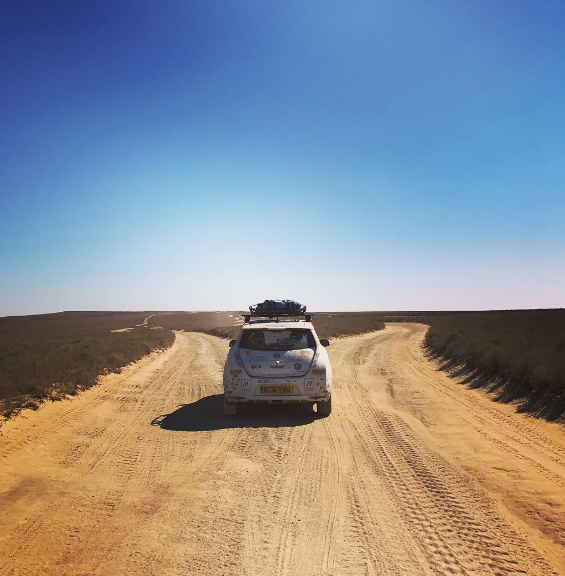 After a long ferry ride over the Caspian Sea, Chris and Team Plug In Adventures made it to Aktau, Kazakhstan where the adventure really begins where he will become the first person to attempt to cross the country from West to East in an Electric Vehicle. As always, the Team Plug In Adventures took time to experience all that the area had to offer with the help of their translator, Marat, and Gulsym of the Mangystau region tourist office. They took in breath taking landscapes, sampled the local cuisine, and even stayed in a Yurta, a traditional Kazakhstani home. Their journey certainly attracted a lot of attention given that it has never been attempted before. Chris was interviewed for the Aktau Regional News who were very interested to hear how he planned to cross Kazakhstan in the AT-EV. Kazakhstan was where the LEAF AT-EV was really put through its paces. The off-road adventure posed quite the challenge and the team got their first puncture during this stretch of their journey, and further down the road the wheel came off completely! Getting a charge seemed to be the least of their worries though with Chris commenting on the variety of options available to them to get them powered up and back on the road throughout their journey through Kazakhstan. Not long now until they reach Russia! That finish line is getting tantalisingly close! Keep it up guys!